Home > Shop By Brand > Griot's Garage Car Care for the Perfectionist > Griots Garage Leather Care Spray 22 oz. Griots Garage Leather Care Spray 22 oz. Replenishes vital nutrients in leather upholstery. Griot's Garage Leather Care Spray cleans and conditions leather seats with a non-greasy, natural finish. 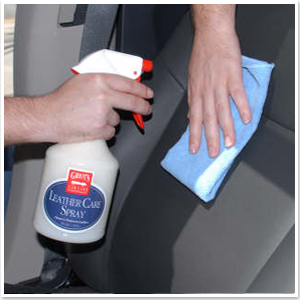 It's the easiest way to maintain leather upholstery! Use Griot's Garage Leather Care Spray on newer leather to replenish natural oils and maintain the soft, supple texture. It was a challenge to develop a leather treatment that replaced vital nutrients, dried clear on perforated leather, left a non-greasy, supple finish after the final buff and actually smelled like new leather. Griot's Garage Leather Care Spray does all of the above and will clean soiled leather surfaces! Griot's Garage Leather Care Spray is perfect for newer leather. Leather Care is a highly concentrated liquid that penetrates deep to replenish the natural oils of your leather fibers. It's highly concentrated and should be used sparingly. Regular use will maintain the soft, luxurious feel and wonderful aroma of leather upholstery. Griot's Garage Leather Care Spray is easy to use for a quick cleaning and conditioning. Before using it, clean leather seats with Griot's Garage Interior Cleaner. Then spray Griot's Garage Leather Care Spray onto your microfiber cloth and wipe on the leather. Wait a minute for the vital oils to penetrate the leather. Then wipe off the excess product with the microfiber towel. Griot's Garage Leather Care Spray quickly cleans and conditions leather upholstery. Griot's Garage Leather Care Spray dries clear on perforated leather and feels clean to the touch. Use it as often as necessary to maintain clean, soft leather. If you drive an older vehicle with dry, stiff leather, use Griot's Garage Leather Rejuvenator for deep nourishment. Griot's Garage Leather Care Spray maintains the softness, look, and smell of newer leather with natural oils. Sit back and relax knowing your leather seats are in good hands with Griot's! Headline says it all. It does seem to clean and leaves a nice matte finish, but the smell is intolerable. It sticks around for a while too. I contacted AG, and they kinda blew me off on this one... said to apply a conditioner to eliminate smell. I did this, and it worked, but this is supposed to be a cleaner AND conditioner. That's why I bought it. Not a good deal. I actually got this by mistake. So after AG made it right, (which is why I buy through here) I used it on my wife's car. Leaves seats non slippery, and it smells like old English leather. Leather spray is just one of the sensational products offered by Griots Garage. I have used their products exclusively for over 10 years.